FOR SINTERING, BONDING, DECORATING, ANNEALING & OTHER HEAT TREATMENT. UNIQUE/PERENY belt kilns, furnaces or ovens are the reliable and economic way to carry out continuous heat processing of ceramic, glass or metal materials. These continuous belt systems are available in wide ranges of length, width, conveyor speeds and temperature zone configuration to suit individual process requirements. Units with widths up to 10 feet and lengths of 100 feet or more allow selection of the right size system for the best combination of production cost and energy efficiency. Choices of electric or fuel fired models are available with conveyors designed for process temperatures up to 1900*F/(1035*C) in various atmospheres. Exterior – Modular construction consisting of heavy gauge steel, welded and reinforced with structural steel members to form integral units. Interior – Standard linings of energy saving multi-layer ceramic fiber insulation. 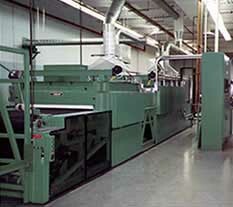 Other linings are available for special process requirements. Conveyor – Conveyor materials selected to meet process conditions. Positive tracking conveyor guides and support members amply distributed through the load zones. Drive mechanism and idlers provided with variable speed, positive traction and tensioning adjustments. Process Zones – Designed to meet specific process requirements for pre-heating, soak, cooling and atmosphere. Electric or fuel fired systems for radiant, recirculating, direct or indirect operation available. Various belt widths, working heights above conveyors, zonal lengths, heat input ratings and conveyor speeds. Special alloy conveyors. Door, Power operated door closures and zone partitions. Powered exhaust and recirculation systems. 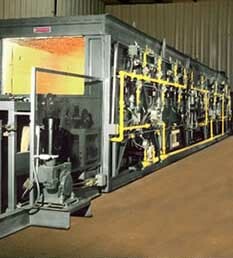 High velocity jets for controlling flow of gases within chamber. Coolings, Variety of techniques to match product and atmosphere requirements. Special interior linings. Zonal separation, Adjustable baffles for zonal separation when product height varies. Instrumentation ranging from basic on-off to full proportioning automatic temperature control. Conveyor controls ranging from push button to fully automatic sequenced and interlocked systems. Adequate building and foundation with clear access for location of unit. Necessary fuel and electrical services for operation. Connection of all utilities to unit in compliance with applicable codes. Hoods, stacks or vents in building roof to exhaust waste heat and products of combustion.